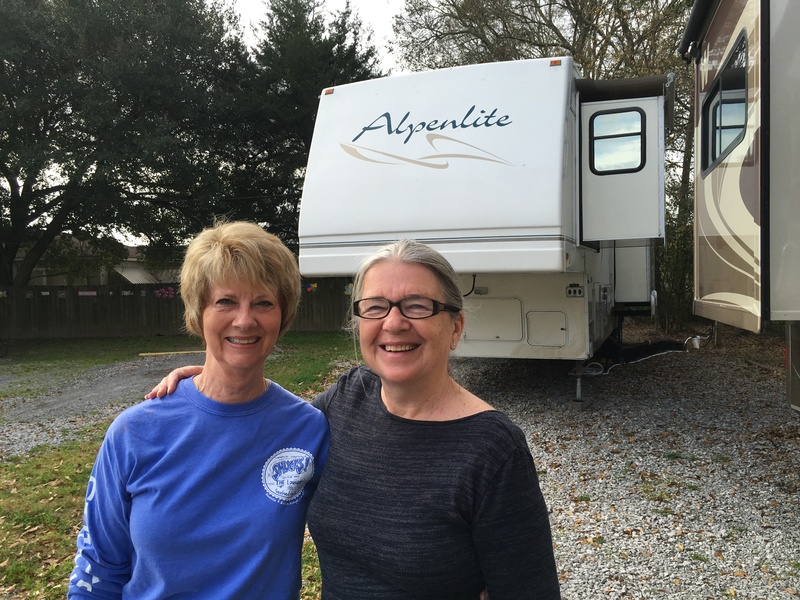 Louisiana – Let's Go RVing! What a fun day we’ve had. After a good night’s sleep we woke up to a pretty brisk morning. In fact we even had to turn the heat on for a bit but it quickly warm the coach up. Does someone actually do this? We left a little after 10:00 headed for Palmetto Island State Park which is fairly close by. When we got there we found that due to our “old age” we got in free. We first just rode around in the car and got the lay of the land. 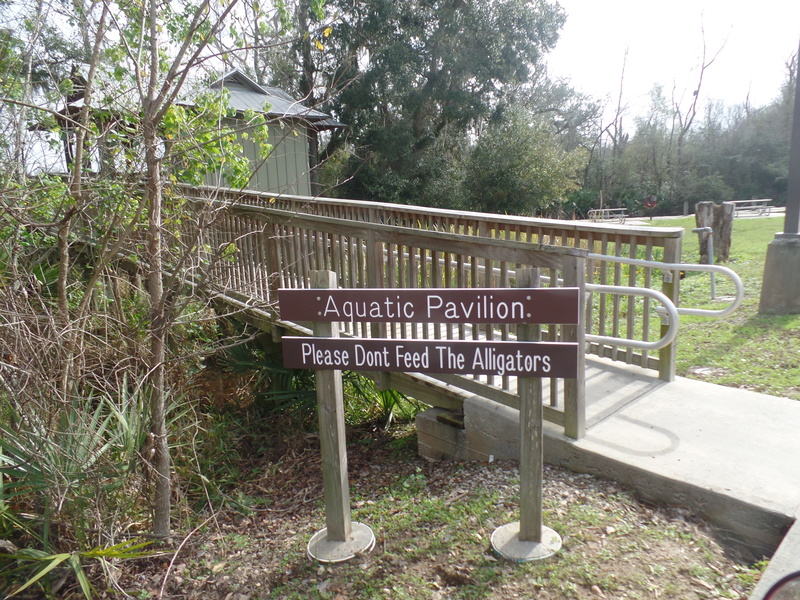 Loved seeing the “beware of bears” sign and instructions not to feed the alligators. Like I would! They have a nice campground there with nearly 100 sites. They’re large, wooded, and private and some are even paved. I think the nightly rate during the winter is $18 and then $22 during the summer for water and electricity. Apparently some people are staying awhile because Jerry noticed the dump wagons near some of the units. Yuk! We got the bikes off of the car and took a nice long bike ride, the first in a long while. 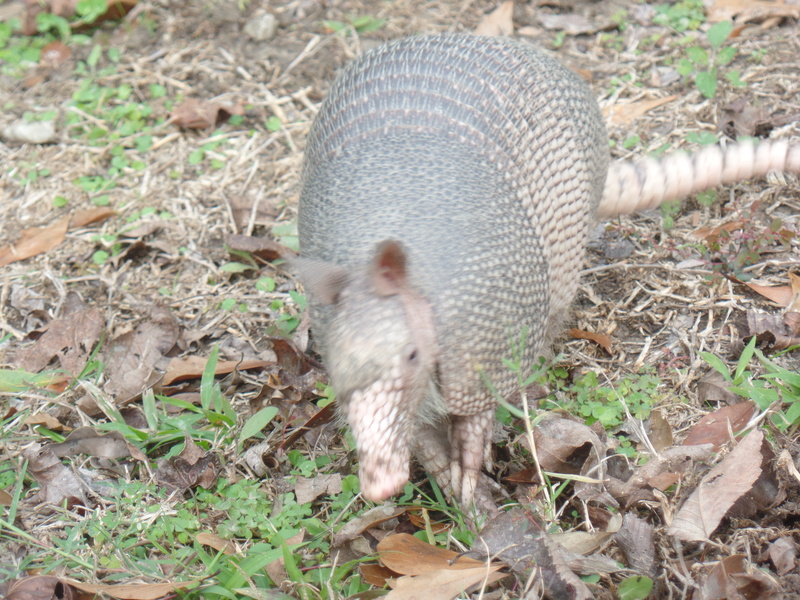 Along the way we saw several armadillos, something we don’t see in NC. They didn’t seem to be bothered by us as they continued eating as we snapped several pictures. A little rest along the way and yes, it does look like I’m advertising for the American Saddlebred! We’re planning to do some more bike riding in San Antonio but the extremely cold temperatures predicted may change that plan. We rode nearly six miles stopping once at a boat launch to rest a bit. It was so much fun to be back on the bikes. Due to cold weather and holidays we haven’t been able to ride at home so this was a nice bonus. 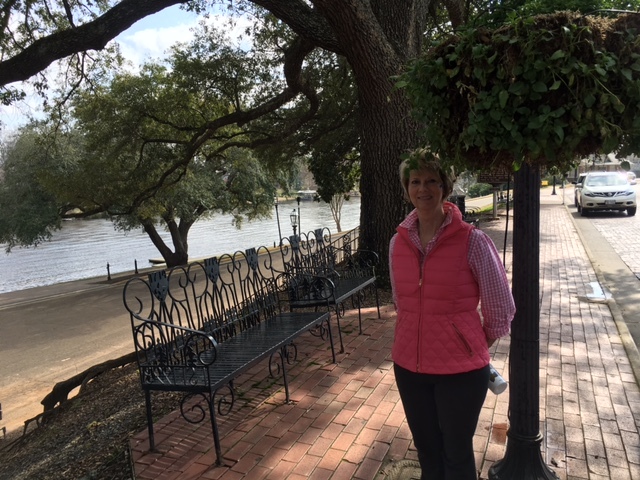 We came back to the campground, ate lunch, got the meatballs in the crockpot for the happy hour tonight and then headed out to Shadows on the Teche in nearby New Iberia. It is a lovely restored Antebellum home nestled among beautiful old oak trees draped with Spanish moss. I know that the moss is a parasite but it is still pretty and adds so much atmosphere! The home was built I 1984 and four generations of the family lived there through the Civil war and on into the late 1900’s when there were no more descendants. During the war Union soldiers informed Mary, the wife of the original owner that she would have to leave the home. She staunchly refused so they put her under house arrest saying that she could stay on the second and third floors. The bottom floor was used by the soldiers. Due to her tenacity, when the war was over the soldiers left without burning the home down, an act that was usually perpetrated when the soldiers left. The last surviving member of the family, William Weeks, petitioned for years to get someone to take over the home and finally the National trust for Historic Preservation took it over. William Weeks died the next day. 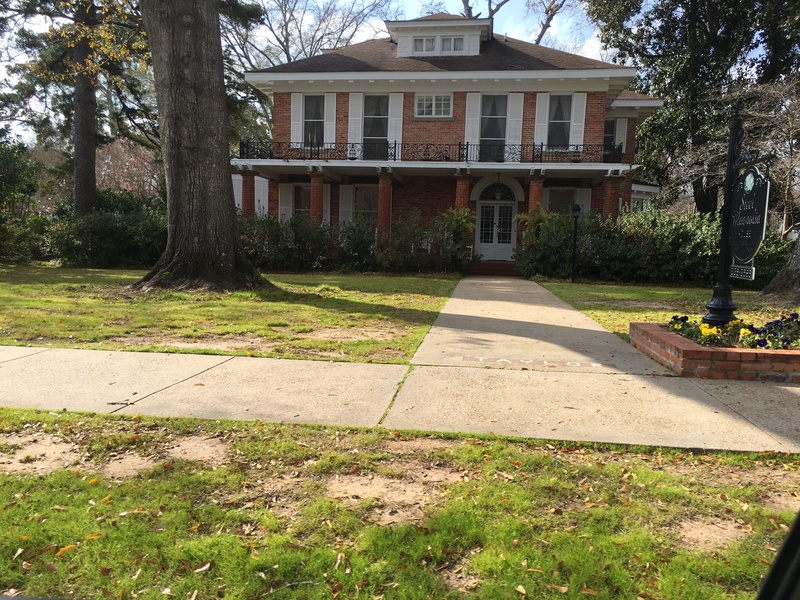 Not only did he leave the home to the Historic Preservation but also left them $175,000 to complete the restoration. 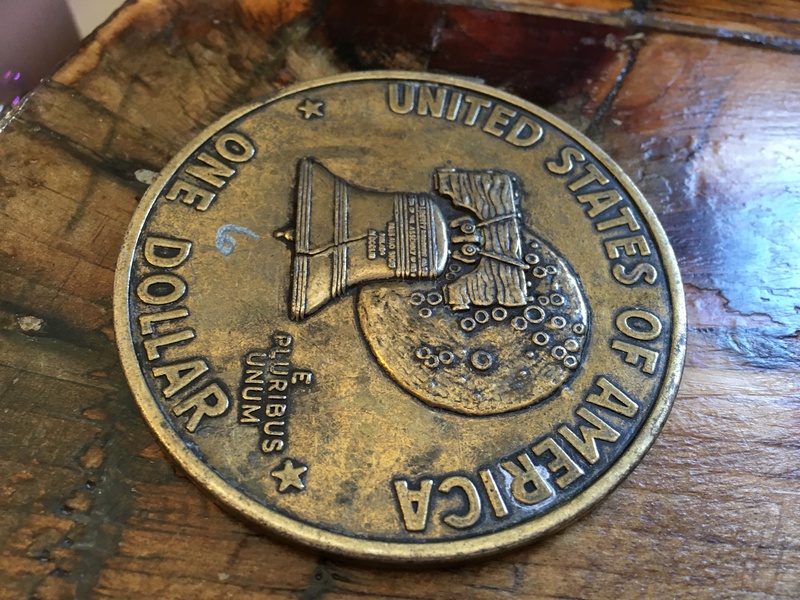 The family apparently kept everything from building receipts to clothing and over 17,000 items were discovered in the attic thus giving a clear picture of life in the home. 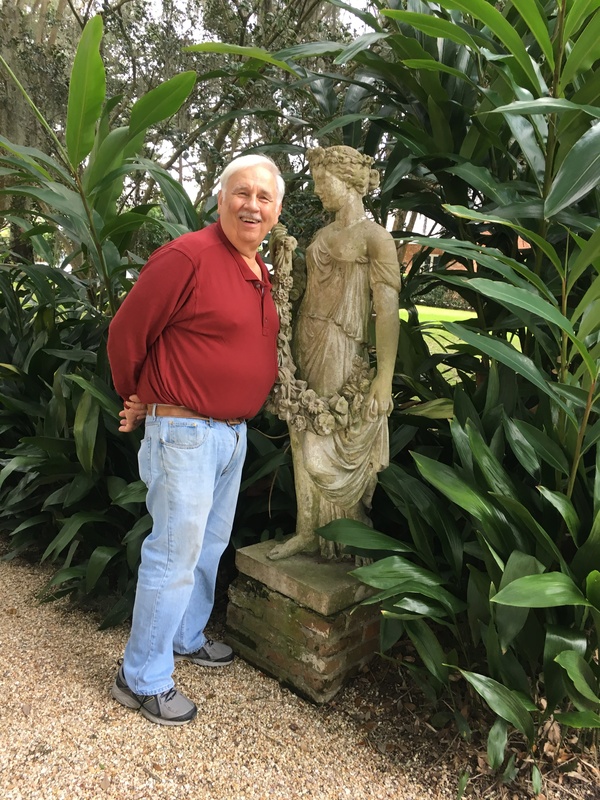 The gardens are beautiful as is the statuary. Interestingly enough there were two other couples on the tour and they were from Virginia. One of the guys is stationed at Camp Lejeune in Jacksonville, NC. Small world! We returned to the campground, got the meatballs and promptly hustled over to the Happy Hour. It really was a fun couple of hours. 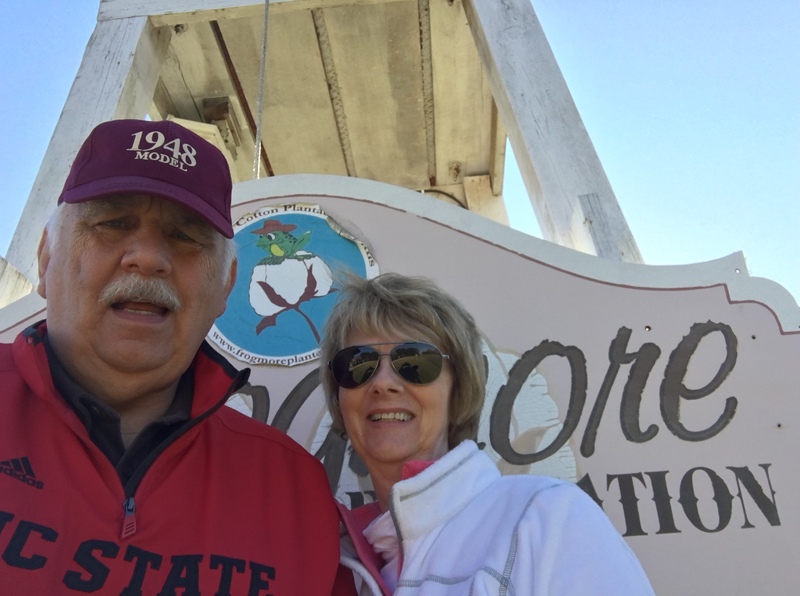 We visited with another couple that we had met last year, Mary Ann and Bill from Oklahoma and then met a couple who just started full timing two weeks ago and are from Wilmington, NC. Again, small world! After a couple of hours we went back to the coach and settled in for the night. I did a lot of work on getting blogs entries ready to post when we have good Wi-Fi, if we ever have good Wi-Fi and then turned in. Friday will be a long day! What a beautiful day although the cold front did move in so it was a bit chilly today. The wind probably dropped the temperature about 15 degrees. I didn’t wear a coat, just a vest because I had no idea we would be outside as much. 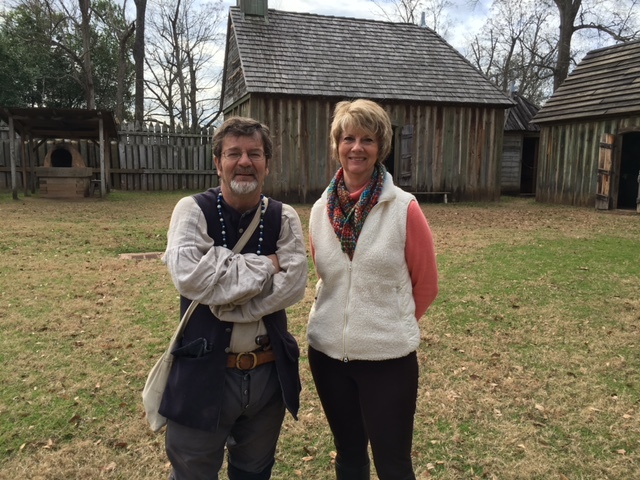 Our first stop was the Fort St. Jean Baptiste State Historic Site. We’re going to see a fort – why did I think I wouldn’t be outside? Duh – anyway, back to basics. Natchitoches became the first permanent European settlement in the territory later known as the Louisiana Purchase in 1714. In 1716 Claude-Charles Dutisne was sent to Natchitoches to build and garrison an outpost to prevent Spanish force from crossing into French Louisiana. The outpost was named Fort St. Jean Baptiste. Although in name it was a fort it was mainly used as a trading post. Upon our arrival our interpreter immediately took us outside on a tour on the fort. The first building we entered was at the guardhouse. Eight men were on duty at all times and if perchance there was trouble there was a jail immediately next to it. We also saw a recreation of the original chapel which is now The Minor Basilica of the Immaculate Conception located in Natchitoches. Other buildings included the commandant’s house and the room that housed eight soldiers. There was a slanted wooden structure on each side of the room and that were the eight men slept! The main building has several different scenes depicting life during that time. They also had a map on the wall that showed the vastness of the Louisiana Purchase. I had no idea that it encompassed such a large area reaching all the way to Canada. 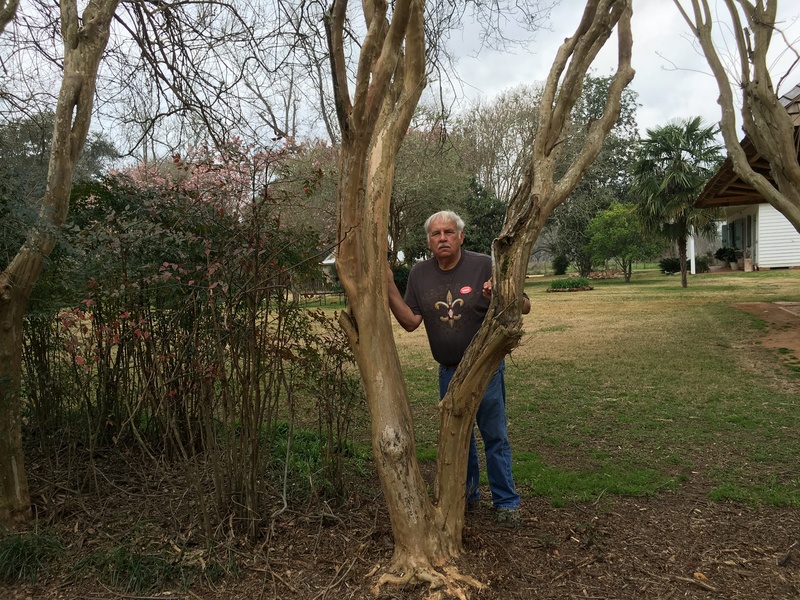 When we left the fort we went in search of the American Cemetery, the oldest cemetery in the Louisiana Purchase. Though not a large area it is still in use. We saw markers as late as 2014 and obviously much earlier. Since it was about noon we decided to have our picnic lunch on the Cane River Lake riverfront. Although it is 36 miles in length and I had assumed it was a river it is actually a lake formed when the Red River jumped its banks. As I said in an earlier blog it is a lovely place and just perfect for a picnic. Just down from where we had our in the car picnic was the beautiful Beau Jardin which features a garden area with a lovely waterfall and bridge. It must be a favorite place to take pictures because not only were we taking pictures but there were others there as well trying to capture the beauty. Our next stop was the Louisiana Sports Hall of Fame. The bottom floor is dedicated to the inductees into the Hall of Fame and included such renowned people as Archie Manning, Terry Bradshaw, Pete Maravich and of course Shack. The second floor covered the history of Louisiana as well as all of the sports played in Louisiana including pro, college, high schools as well as other teams. I was amazed at the number of sports included. 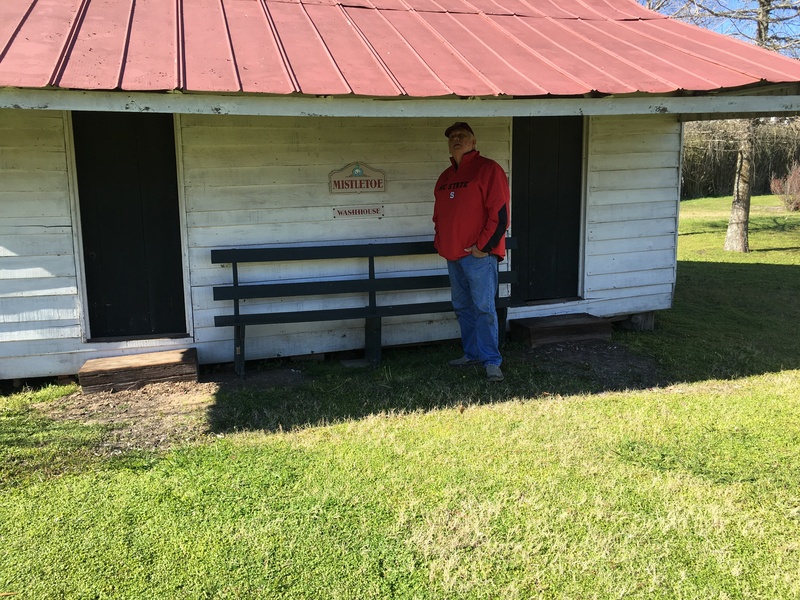 Of course one always thinks of football, basketball and baseball but they included horse racing, bowling, hunting, tennis, golf, car racing, and boxing – if a sport was played in Louisiana it was covered in this display! Next we just wandered around the town going in and out of shops visiting with the various shop owners. 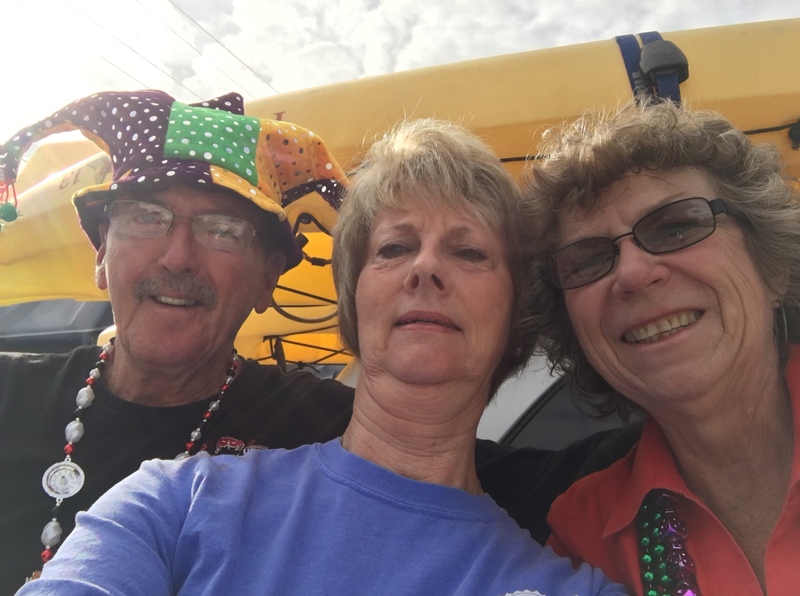 One lady we talked to use to be a full-timer until her father got sick and she went to Natchitoches to care for him. After a trip to the grocery store we headed back to the coach. We’ve been in the area long enough that we no longer have to use the GPS (fortunately because Gypsy gets turned around a lot) but today as we were leaving the city we ran into a detour. I have no idea what was going on but police were blocking our route so we did rely on Gypsy once again. This has been a lovely, quiet visit to a beautiful town. It reminds me so much of Niagara on the Lake with its quaint shops, hanging baskets and lanterns. As we rode around I continued to be amazed at the number of B&B’s located in the town. I realize that it is a college town so that could account for some of them. 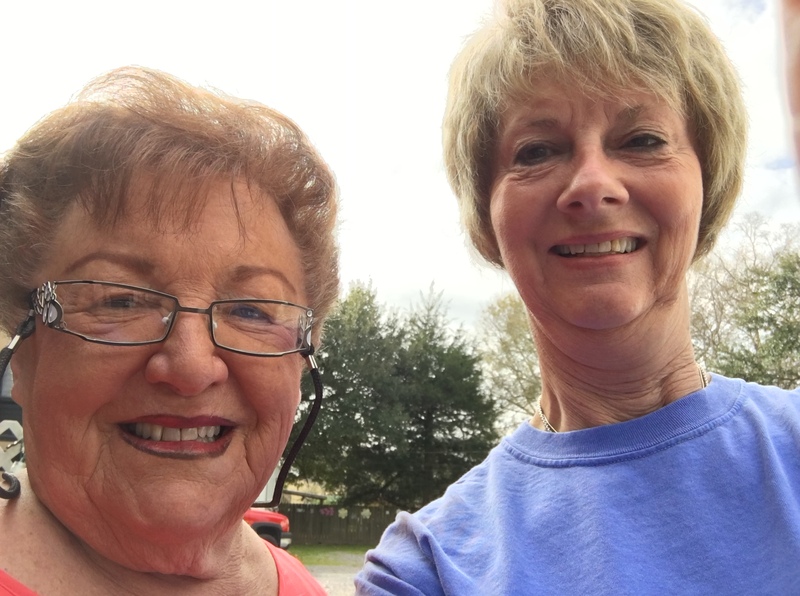 On our rides from the campground in Colfax to Natchitoches we have seen many cows, many pecan trees along with dead animals on the side of the road. Today we saw a skunk (have never seen one of those on the side of the road in NC) and a coyote. A quiet night getting things ready to pull out in the morning and head to Vidalia for the last leg of our journey into Louisiana. Believe it or not we got an earlier start today! Jerry said to wake him up by 7:00 so I did and we actually got on the road around 9:00. We had not quite decided what we were going to do as it everything was so weather dependent. The forecast was for rain most of the day so we felt that perhaps we should do the inside things today. 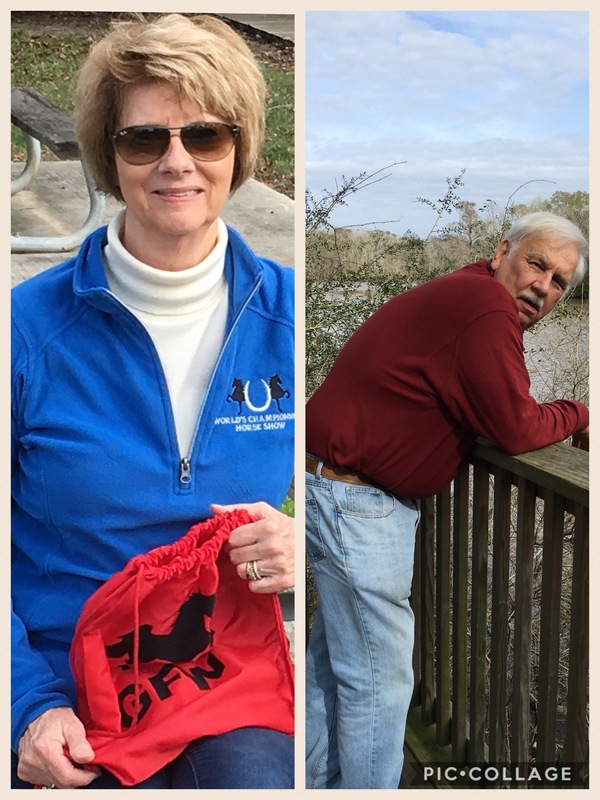 It was not raining when we left though so we decided to try out luck on the Cane River National Heritage Trail. There were several sites along the way that we wanted to see so we thought we’d start out and if the rains came we go to Plan B. Cane River National Heritage Trail takes you through the scenic byways of northwestern Louisiana. A largely rural area you can see beautiful agricultural landscapes full of pecan trees, cattle and horses. The area is known for its historic plantations and its distinctive Creole architecture. A winding road takes you by each of the thirty-two stops which include plantations, churches, homes and other historic sites. We made a brief stop at the St. Charles Borromeo Chapel which represents the only known instance in the United States of a white mission congregation sponsored by a church whose members were primarily people of color. It is now privately owned so we couldn’t go in. I think it’s primarily used for special occasions now. I peeped in the window and it looked like it was being used for storage. 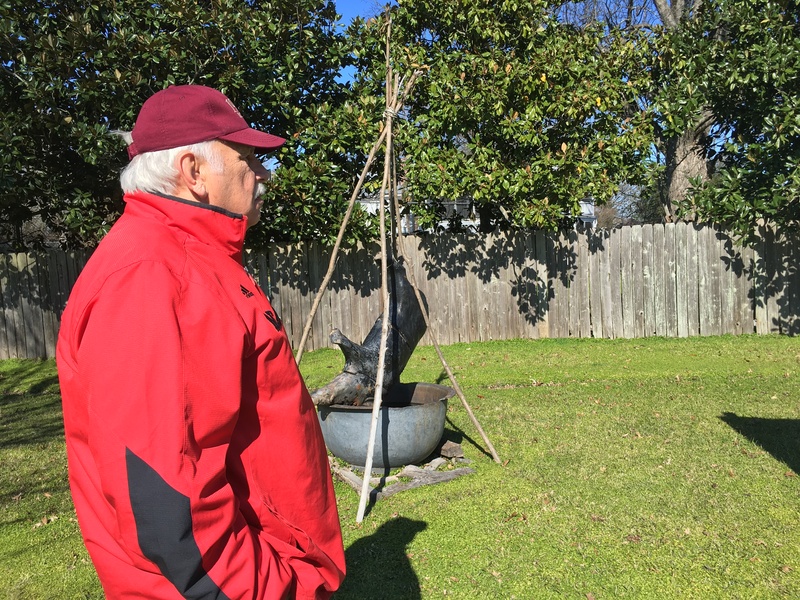 Our next stop was the Cane River Creole National Historical Park, Oakland Plantation. Although Oakland Plantation is the most complete Creole plantation in the South the house was not opened because they were repairing the roof. At the rate they’re going it won’t be opened for a long while! No one was working! We talked briefly with the volunteer guide who is also an RVer. She has a fifth wheel which she will be keeping on the property for about three months. It is full hook up and no charge. 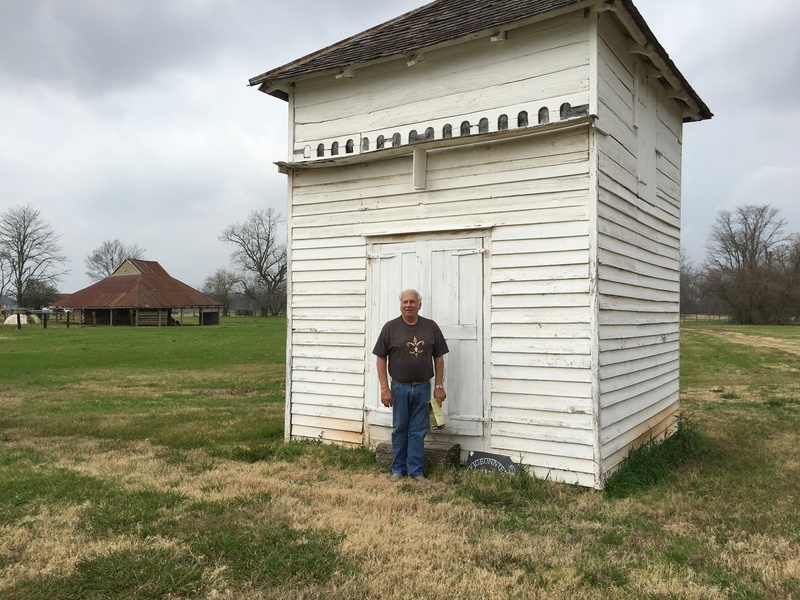 After a visit with her we wandered through the mule barn, by the pigionnier, went in the overseer’s house and then a slave cabin. The building that is now used as the administrative building was formerly a doctor’s house. It was the slave owner’s responsibility to keep the slaves healthy so this particular owner had a doctor on the grounds although sometimes the doctor would travel to other plantations. 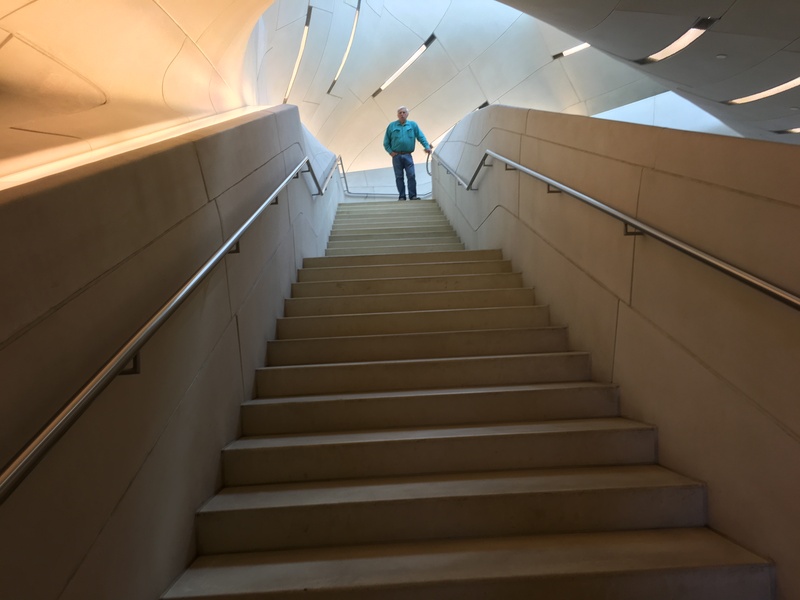 Interestingly enough, there is no guide per say but there is a phone number that can be called and when a visitor enters the number of the building being viewed a brief explanation is given. I called several time and put the phone on speaker so Jerry could hear it too. 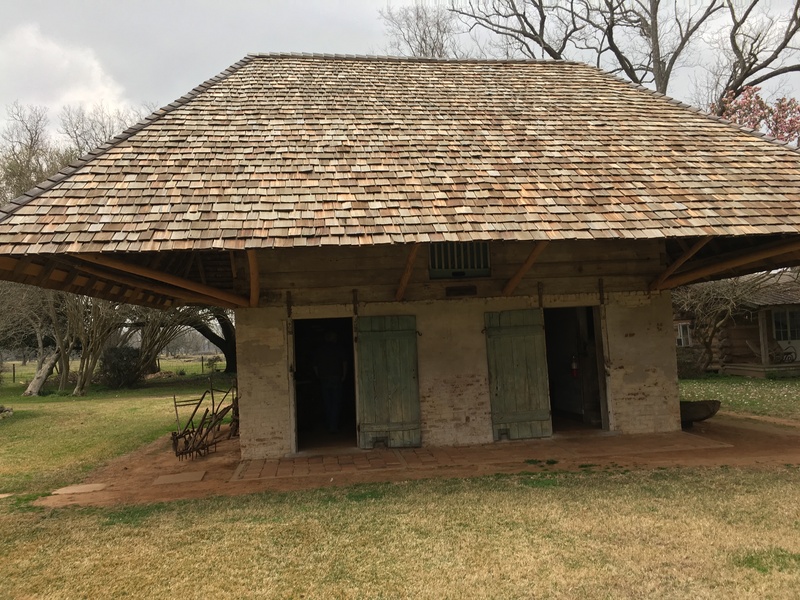 Not far from Oakland is Melrose Plantation which was established by free people of color (gens de couleur libres) around the time of the Louisiana Purchase. It eventually became an artist’s retreat encouraging artists of all types to come to paint, write, etc. The rule was that they must spend no more than three days doing nothing. If three days had passed and they had nothing to show for it their bags were packed and they were sent on their way. Too bad if they had writer’s block! It was hard to remember that it is January because the gardens are so pretty! Melrose was also the home of the legendary Clementine Hunter, a nationally renowned folk artist. When she painted her first picture she used oil paints that another painter had left behind and when she presented the picture to the owner he didn’t believe that she had painted it because she kept saying she had “marked” it. That was her way of saying that she had painted it. 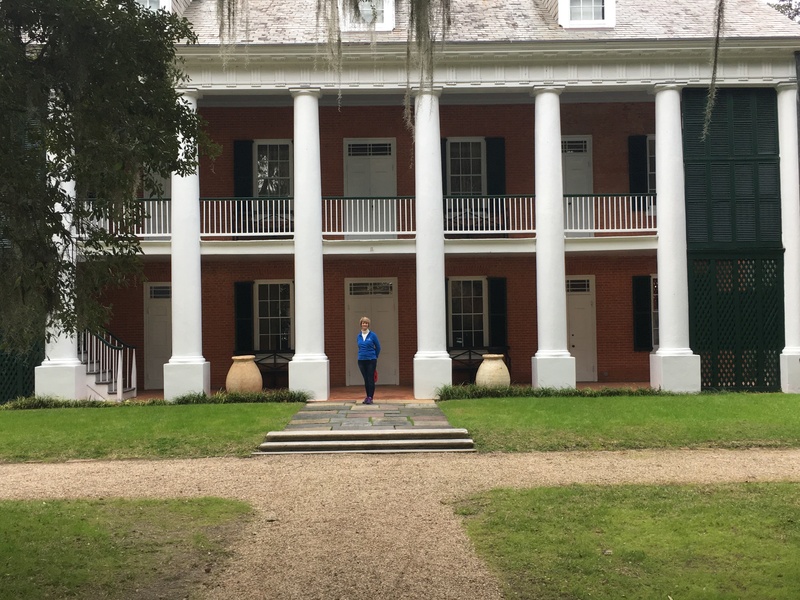 Her original paintings that are usually at the plantation are presently in the Louisiana Sports Hall of Fame right now as there is restoration going on in the plantation building where they are usually housed. They will be returned in April. An interesting house that we saw was the African House. The roof overhangs a great deal to keep the sun from shining on the walls of the house, thus keeping it cool during the day. When someone remarked that there was a door on the second floor with no outside access the guide told us that it was a form of security. The inside of the Big House as it was referred to was interesting. The upstairs was added later after the Red River which was across the road rose over the banks. There are several bedrooms, two for the six boys (three each), one for the older son and one for the daughter. One of the bedrooms is now used to house some of Clementine Hunter’s pictures. When she first began to paint she didn’t sign her pieces because she couldn’t write. She was finally taught to write a “C” and an “H” and initially signed her pieces “CH” but she didn’t like that because she said the “C” was turned away from the picture. She eventually reversed the “C”. In later years the “C” began to supplant the “H” and that is how her paintings are now dated. The pictures are of events that occurred in her life. I saw one of a Baptism and others of scenes around the plantation. 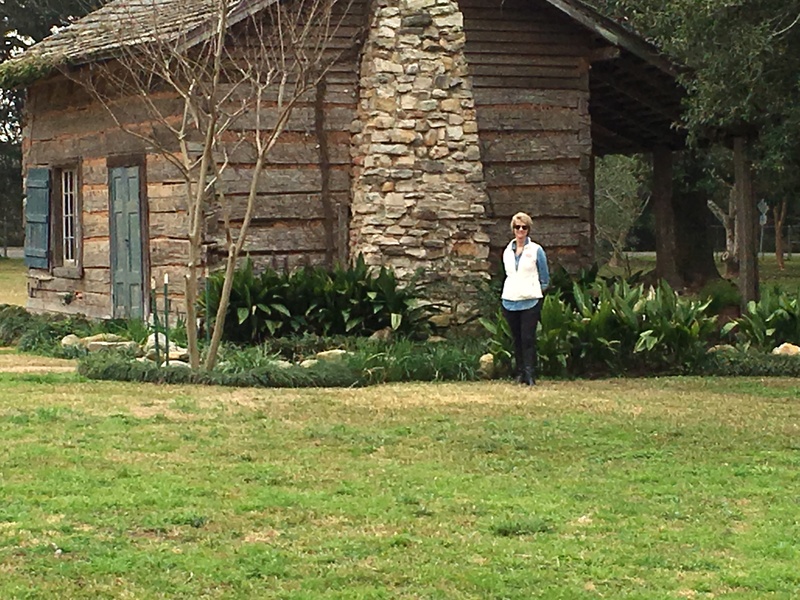 By this time we were getting hungry so we decided to ride on down to Magnolia Plantation and have our picnic lunch. We realized when we got there that Magnolia Plantation is privately owned and only the slave cabins are opened for visitors. We’ve already seen a lot of slave cabins so we passed on visiting those. We sat in the car and had our lunch. On the way back to Natchitoches we rode by St. Augustine Catholic Church and Cemetery. It was the first Catholic Church established by and for people of color in the United States. It is a large church that is now on the National Register of Historic Places in Louisiana. Our next planned stop was the Fort St. Jean Baptiste State Historic Site. Imagine our surprise when we found it closed only opening Wednesday through Sunday. Someone told us yesterday that many businesses worked all week and then closed on Sundays and Mondays to recuperate. Guess in this case it is Monday and Tuesday. It was just as well as we were getting a bit tired and tomorrow is another day. Along with Fort St Jean we plan to visit the Louisiana Sports Hall of Fame. Although it’s supposed to be sunny it’ll be cooler so a good inside tour is what we need. The sky said it was going to rain soon so we headed on back to the campground. Jerry decided to “rest his eyes” for a bit while I caught up on the blog. May well join him soon! Another late start so we headed out to Natchitoches to just ride around and visit the town and we had meat pies on the brain. Natchitoches is about 35 miles from where we are staying but it is not a bad ride at all and we got to see some of the countryside. Boy, there surely are a lot of cows around here! We also saw some more rice fields with crawfish traps in them. 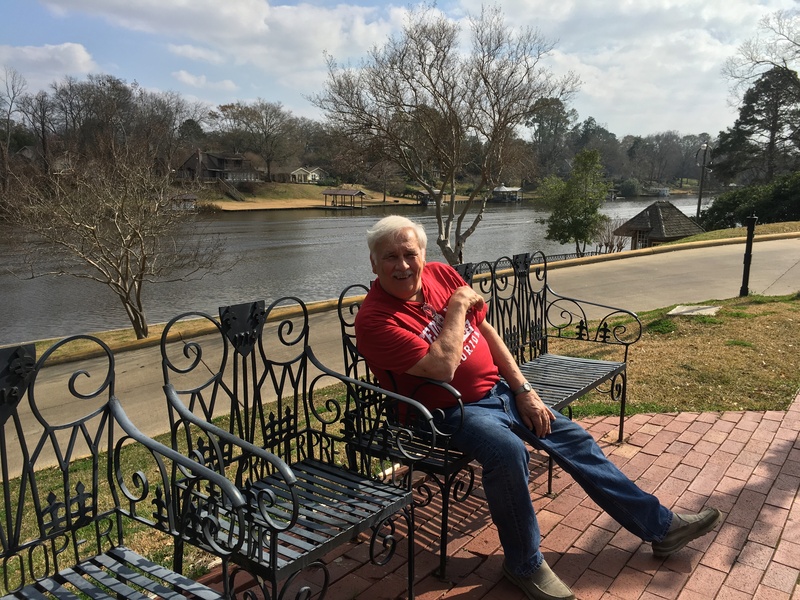 Natchitoches is a quaint town right on the banks of the Cane River. There is a nice Riverwalk with benches or a nice area to spread a blanket and enjoy the sun or have a nice picnic. There are also lovely hanging baskets and one block has old lanterns hanging at various places. There are assorted shops along the way from souvenirs to antiques to clothes. 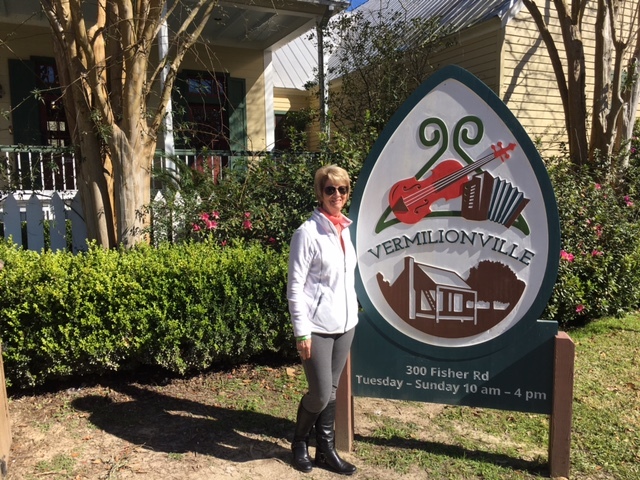 We parked right in front of the famous Kaffie Frederick General Mercantile which is the oldest general store in Louisiana and an important landmark for the community. It has the original freight elevator and a 1910 cash register and both work and are used. After walking around the store I decided that if they don’t have it you don’t need it! Jerry wanted to have a duplicate key made and of course they could do it. I bought a small Yeti cup for coffee and a salad sac. The sac is supposed to keep salad fresh for days – we’ll see. A lady who worked in there told me she bought one and it really worked. She said she didn’t throw away nearly as many spoiled vegetables now. Our next stop was the Visitor’s Center right there on the main street. She told us a great deal about the town and showed us some interesting sites to see. I had wondered about the pronunciation of Natchitoches so of course I googled it. “Toche” is pronounced “tish” and is added to a word for that sound – I think, so Natchitoches is pronounced nack-a-tish. It was voted by USA Today as the 2015 Best Southern Small Town. Since it was nearing lunch time we asked about the famous meat pies and she suggested Lasyone’s so off we went in search of it. We didn’t quite know what to order so we asked the waitress for help. I ended up with a crawfish pie and onion rings and Jerry got a meat pie (pork and beef) with red beans and rice plus some carrots. After we had a few bites we decided to exchange pies so I ended up with the meat pie and he got the crawfish. We weren’t too crazy about either of the pies and Jerry didn’t love the red beans and rice but the carrot soufflé was to die for. It tasted a lot like sweet potatoes. Other than boiled crawfish which I understand are a pain to eat I think we have tasted every local delicacy that Louisiana has to offer. We are ready for some regular old food cooked at home. I never thought I’d say I was tired of eating out but I am! We walked around the town a bit going in and out of the shops. It really was too late to do much touring so we rode around the town a bit more and saw some of the beautiful historic homes. Some are privately owned and several are B&B’s. We rode by the home that was used in Steel Magnolias and is now a B&B. Our next stop – you guessed it – Walmart for some hamburgers for dinner! After getting back to the coach I took a little nap and Jerry read. Then he went for a walk and ended up meeting the folks at one of the two other RV’s here. I walked down a little later and we had a nice visit with a couple from Texas. Jerry grilled burgers and it looks like it’s an NC State basketball evening. 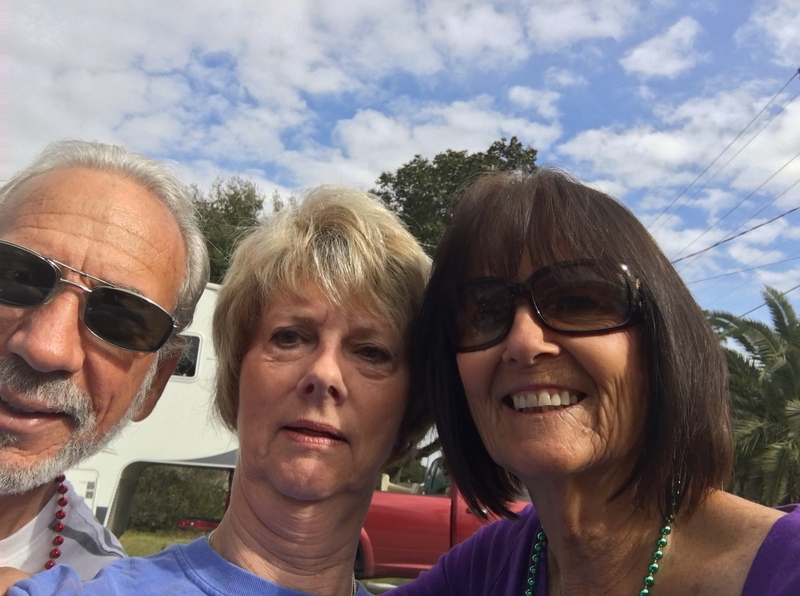 What to say about Betty’s RV – well, we came for four days, added one and then ended up staying for eight! As I understand it that’s not how most folks to it though as they usually extend their stay much longer. We were on a fairly tight schedule so we sadly pulled out Sunday morning but not without hugs and good-byes and hearing “hope to see you down the road”. When I was doing my research both on various park reviews and on IRV2 and rv.net Betty’s RV Park kept cropping up. One reviewer even suggested we re-route in order to stay at Betty’s and how right they were. As several reviewers said “they make you feel like family” and yes indeed they do whether you’ve been there one night, one week or one month. As soon as we arrived someone from North Carolina came up and welcomed us – always good to see a homebody. Every afternoon at 4:30 Betty has Happy Hour where everyone brings something to eat, some fancy and some bought from the local grocery but everyone shares and enjoys and afterwards everyone feels they have had dinner. There’s lots of conversation about where everyone is from and then LOTS of recommendations on where to go and what to eat. I feel like I am eating my way through Louisiana! I must say all recommendations were duly noted and acted upon and were without a doubt right on target. We met people from as far away as Canada, Alaska, Washington and California, not to mention Michigan, Texas, Oklahoma and of course the western part of our North Carolina. Betty made everyone feel welcomed and as you entered the Happy Hour she always called you by name so if you couldn’t remember someone’s name her greeting to each person would refresh your memory. Cookie and Jim from Washington State. A selfie with no selfie stick is difficult! In the late afternoon as everyone is returning after touring or doing necessary chores the questions asked were what did you do and where did you eat? Sometimes we even went out together. Dan and Merlene from California . I was trying hard to focus! Last week Jerry and I had the pleasure of having lunch with folks from Michigan and North Carolina. Then this Saturday many joined together for Cajun music at a local bar, Touchet’s. We were the only non-locals there but again they acknowledged and welcomed the group from Betty’s. Lots of friendly people in Louisiana! Earlier in the week Jerry and I had the great pleasure of eating at Shuck’s and we had a nice visit with the owner. He said he was often asked why he didn’t have Happy Hour and he said it was because he couldn’t compete with Betty’s Happy Hour. We ended up missing a couple of the get togethers during the week we were there because of our touring but we tried each day to get back to join in the fun and comradery. 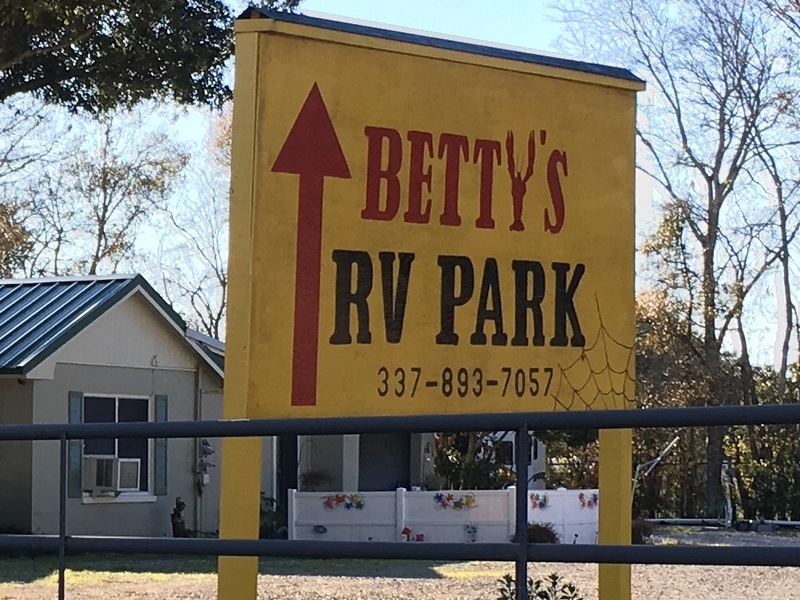 In summation, it’s quite easy to see why Betty’s was selected as one of the top 25 parks in America and also the “Most Fun Small Private RV Park” in the United States. If you get a chance go by and stay for a night – or a month! You’ll feel right at home. 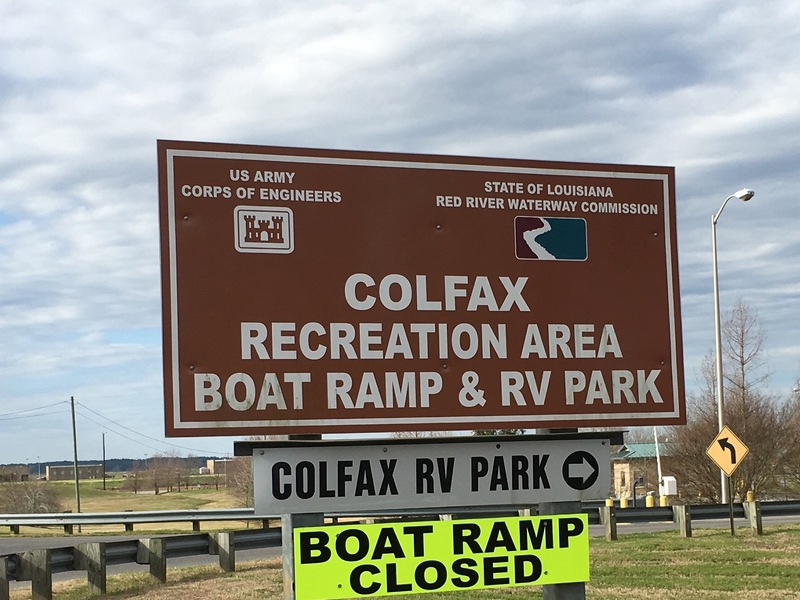 We spent the day getting ready to leave tomorrow for Colfax. We have sort of gotten into a routine or getting the coach cleaned and all clothes and linens washed on the last day of a park stay. That makes the next leg easier so we spent the morning dusting, vacuuming, washing clothes, just the normal clean up. Actually it doesn’t take that long to do it. It’s a lot easier than cleaning a house! Afterward Jerry got the car cleaned out. Things have really accumulated in there during the last two weeks so he got that cleaned and organized. Then we just stood outside in the sunny 70 degree weather and visited with a couple of the guys in the park, one from Oklahoma and one from North Carolina. On Saturday afternoons in this area they have Cajun music. One week it’s held in Erath and then one week at Tuchet’s or as the sign says “2 √’s”. The only visitors or tourists there were the folks from Betty’s RV and they acknowledged us. This was our first exposure to real Cajun music and I must say it’s like nothing I’ve ever heard before. Most of the time the singer was singing in French so we didn’t understand a lot of it. It was very informal and various people walked on the stage and sang and played at different times. They had a variety of instruments including guitars, a fiddle, an accordion, drums plus some other instruments . State was playing Miami today so Jerry watched it on his phone for a while and finally just went outside to watch the finish. He came back in and gave me a thumbs up – whew, finally a win. We left soon after that as we wanted to go back to Hebert’s and get a couple of things. We also needed to stop at the grocery store as we had nothing to take to the Happy Hour. We got a really good cheese cake and came on back to the campground. Happy Hour started at 5:00 so we went over and stayed for a while but we had planned to go out for dinner on our last evening in Abbeville so we left early. Back to Shuck’s we went. 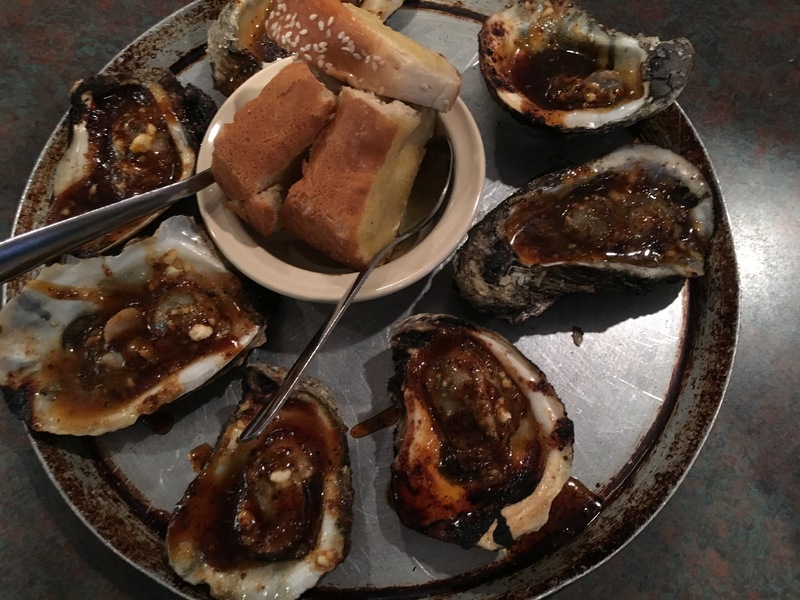 I got Candied Oysters and they were even more delicious tonight than they were earlier in the week. Jerry got crawfish etouffee. I tasted it but didn’t care for it. When we got back to the park I walked over to the Happy Hour which was still going on to tell everyone good-bye although we’ll probably see most of them in the morning as we’re not planning to leave until 9:30 or so. As I said earlier it’s been great being here. A four day visit turned into eight and apparently that is the norm although they say most people end up staying for a couple of weeks or a month! 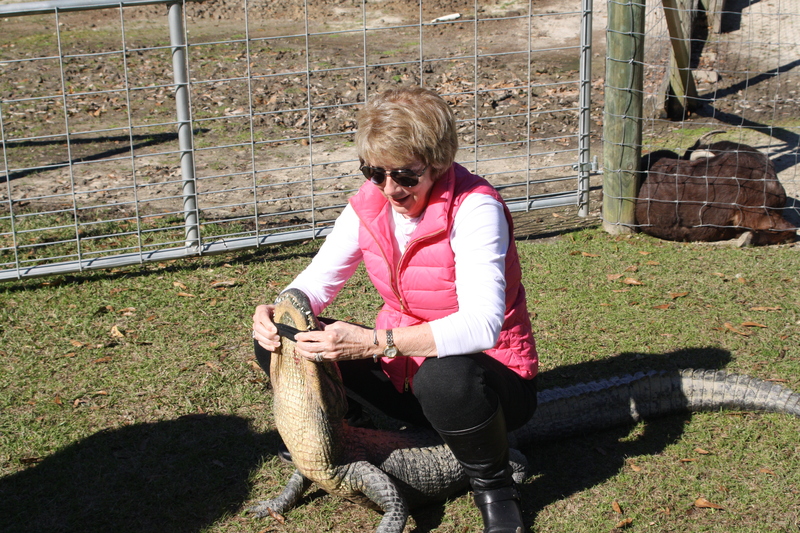 I stepped a bit out of my comfort zone this morning as we made a trek (and it was a trek) to an alligator farm in Hammond. We should have done this when we were closer to Hammond instead of driving over two hours today but it was well worth the ride. 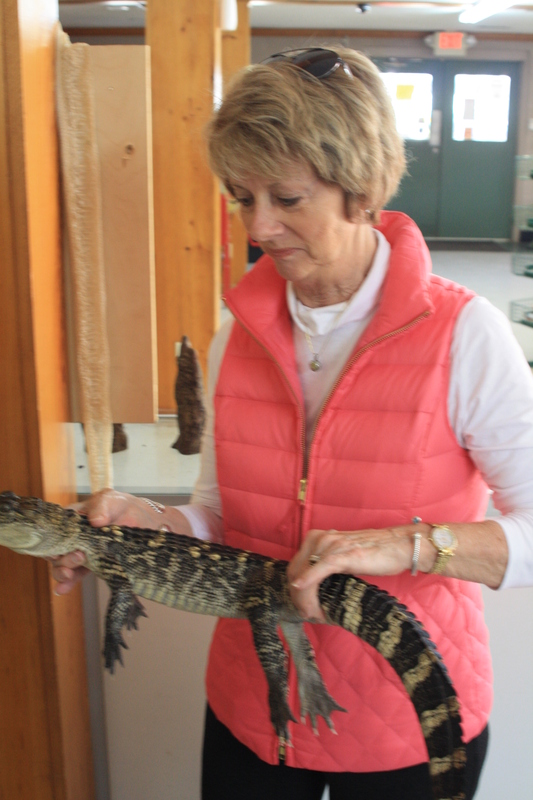 We went to Klieberts Swamp, home of the original “Swamp People” and a gator farm. It was established in 1957 at which time the owner bought about 300 gator eggs and hatched them and as they say, the rest is history. They have gators ranging from 9 to 18 feet but we only saw two large ones as this is not the time of year when they are active – thank goodness! The area is filled with turtles also, several different kinds. We were able to see many of them although when we walked by them some would slide into the water. When we reached the pond that held the oldest gators the guide went in and we stayed behind the fence. I saw a big log only to realize that it was a really big gator. He tried to get the gator to come up to the edge but he wouldn’t. It was amazing to see the “logs” there and I was glad I was behind the fence although they aren’t very active. We saw one scoot back into the pond and although they are supposedly very slow at this time of year I thought he moved pretty fast! The last place we stopped had several gators in there, probably 20 or 30 that were from four to eight years old. The tour guide went in to bring one out. It was interesting to watch him go into the pen. Although the gators are very lethargic at his time of year I noticed that he never turned his back on any of them. As he entered I told him to be careful and he thanked me! Most of the gators were out of the water lying on the bank but as soon as he started walking toward them many of them went into the water. The guide brought one out dragging him by his tale. As soon as he could he taped his jaws shut. He used quite a bit of tape but said he actually only needed to wrap it once. The guide then showed us how to get behind the gator, pull his tail and then walk up his back, getting on our knees, pressing his head down and then holding his mouth while extending his neck so we could sit on it. Yeah – a lot of steps to follow. I let Jerry go first! Needless to say I was a bit apprehensive so the guide helped hold him as I sat on him. He told me to be sure to cover up the tape with my hands so the picture would be good but obviously I didn’t! Wow – just Wow! When we went in there was a group of school children there and as they went out another guide asked me if I wanted to hold a small gator. Well sure – so I did but he was a young one, probably about one and a half. They also had an Albino Burmese Python. I did not hold that but Jerry did. Yuk! I then noticed that the guide helping us only had his thumb on his right hand as his other fingers had been bitten off! What an interesting visit. In addition to the gators and turtles they have nutria, goats, chickens, raccoons and other animals. They also have a cream colored gator which is extremely rare. After the visit we rode down to Berryland RV and walked through some diesel pushers. Why, I don’t know. Jerry said his next RV would be a diesel and I asked him when that would be. He replied when I won the lottery. Since I’ve never bought a ticket I guess that won’t happen. Fortunately we love the motor home we have and have no plans to buy another! On the trip back we stopped at Hebert’s and bought two stuffed chickens, one with alligator and one with boudin sausage. We also stopped by the Villager Café and bought some of their Langlinais’ French Bread. The loaves are about three feet long! When we got back to the RV I didn’t have any freezer bags long enough to hold them so Jerry ran down to Robie’s to pick some up while I walked over to the Happy Hour to speak to everyone. They were very interested in our trip to the gator farm. We had a sandwich and called an end to a busy day! Tomorrow will be busy too as we go to hear some authentic Cajun music in the afternoon plus prepare to pull out on Sunday morning. It’s been a great week and I hate to see it end but it’s time to move on down the road.